Once again, acting as the bridging voice between the global elite's United Nations agenda and his followers in the Catholic community, pope Francis has ignored the actual statistics and what the community of doctors outside of the “Brazilian Ministry of Health” are saying regarding the lack of evidence linking the Zika virus to microcephaly. Instead, the pope recently put out statements endorsing the birth control method of avoidance, claiming that “avoiding pregnancy is not an absolute evil” in light of the Zika virus storyline which has been created by those pushing the global forced vaccination and depopulation agenda. All with the help, of course, of the mass media. Now that a few weeks have passed since the mainstream media ran with the 2-dimensional, linear, fake-reality, Zika virus stories claiming a direct and certain link to microcephaly, those in the critical thinking medical community agree, if nothing else, on the observable facts- that there is no evidence of any direct link between the Zika virus and microcephaly. What there is evidence of, is that villages which were sprayed heavily with pesticide chemicals, where GMO mosquitoes were released and villages whose drinking water was spiked with Monsanto backed chemical poisons are the villages experiencing the highest incident of babies born with microcephaly. As has been repeatedly pointed out by researchers, doctors and those covering this story for the past several weeks, from a medical perspective we also know that the Zika virus generally doesn't cause microcephaly because there is no mechanism or history to explain it. And we know that among other causes, chemical poisoning and imbalances do potentially cause the disorder and are associated with microcephaly. We also know (as they say in medicine) that “common things happen commonly”. Nature very rarely acts in a way outside of its normal pattern of behavior. The very nature of medicine and science is founded on these observable behaviors and often predictable results. We also know that whenever a scientist or doctor claims something that is not typically seen, that doctor, scientist or scientific body must prove their hypothesis with convincing evidence. No one is immune from the obligation to abide by the Scientific Method. It's one of the key criteria that binds and thus ensures the integrity of scientific and medical claims. That evidence claimed by the establishment and medical “authorities” in Brazil and at the global level, has not been introduced. Zika virus is not proven to be linked as the primary cause of microcephaly. This is the most important point regarding the recent Zika virus engineered scare. Subsequently, what we are now seeing is a slow systematic and often repeated disregard of the 3-dimensional reality that I wrote about recently, so that an engineered artificial 2-dimensional reality based narrative can be perpetuated. This artificial narrative is a dangerous sign of the direction humanity is headed and I argue is the much bigger story here. The propaganda coming from the pope shouldn't surprise anyone who understands how this artificial reality is now being rolled out on the masses on a daily bases and is a symptom of a greater problem. In this example, the pope is simply contributing to the synthetic 2-dimensional reality where the general public is presented with lies and disinformation designed to look feel and smell real, while they push for whatever agenda is desired. 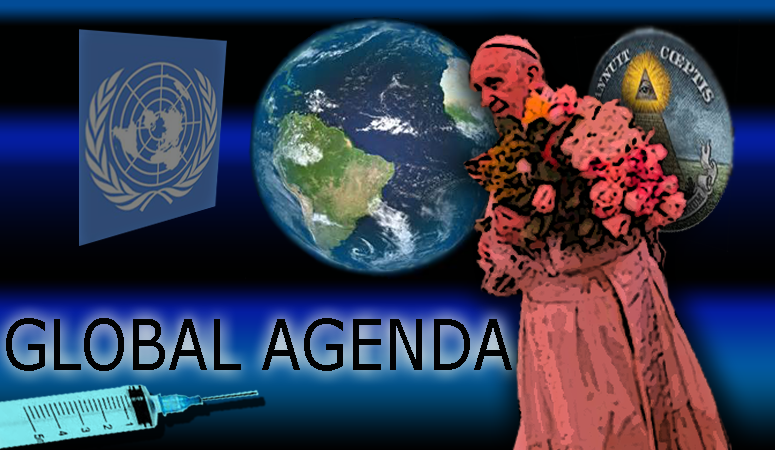 This significant doubling down by the pope on global government U.N. propaganda at the expense of science and reason is another reminder that there is no reason to believe anything put out by the lying and controlled mainstream media and their usual mouthpieces that include people like the pope among others. As already stated, even if 100 percent proof of what exactly has caused the microcephaly in newborns has not been reached, one thing is for certain- there is no evidence that directly links the Zika virus to the microcephaly. Careful to not let reality get in the way of the escalating current fictional narrative aimed at pushing the global agenda to strip away all medical freedoms in the name of an epidemic or pandemic, the pope is carrying on with claims that happen to sound just like the claims engineered by the political authorities and mainstream media. Is anyone surprised? Surely the pope is aware of the scientific reality, nevertheless he is once again going along with the global political narrative, as he has so often in the past, selling Agenda 21, Agenda 2030 and the coming global “sustainable” order as a type of virtue that his followers should heed to. If nothing else, we can use these recent political comments by the pope to remind ourselves who is fighting for what agenda including who is fighting for truth. Probably the most significant and staggering if not frightening fact that puts all of this into perspective is the fact that there are an estimated 1.25 billion Catholics worldwide who potentially listen to the pope as he tells his lies and or is used as a tool of deception by the ruling elite. This is the same pope who has been selling the “sustainable” new world order to his flock and is now a leading voice of the global agenda. 1.25 billion is a lot of people and serves as a reminder that we are engaged in a fierce information war against humanity with no end. If you understand and agree with this article help push back against the global disinformation machine by sharing this message with someone.